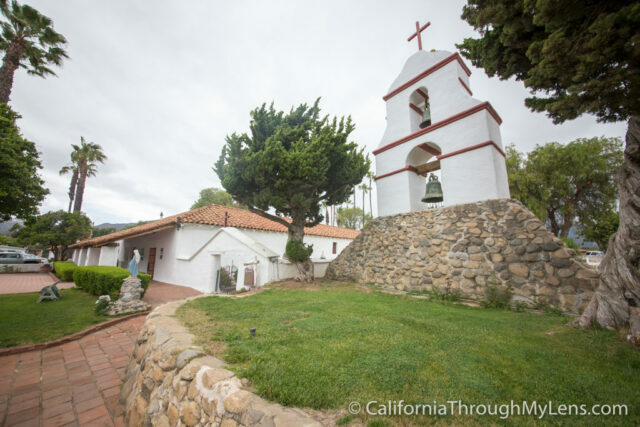 Mission San Antonio de Pala Asistencia, located off El Camino Real in a more inland area, is an Asistencia (assistant) Mission to Mission San Fernando Rey de España and is the only Asistencia still being used. 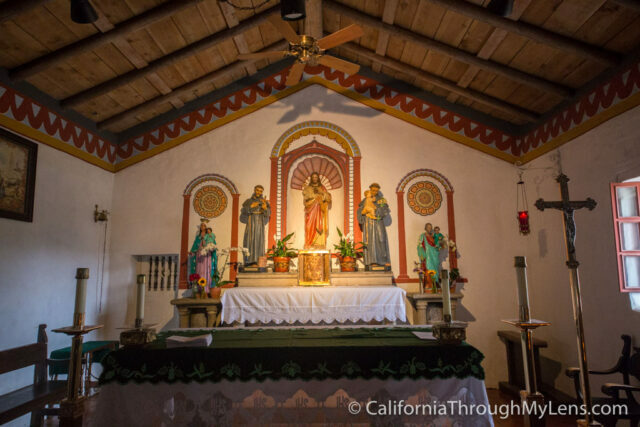 It is still a working church ministering to the local population, and while it is not one of the primary 21 Spanish California Missions it is still worth the visit. 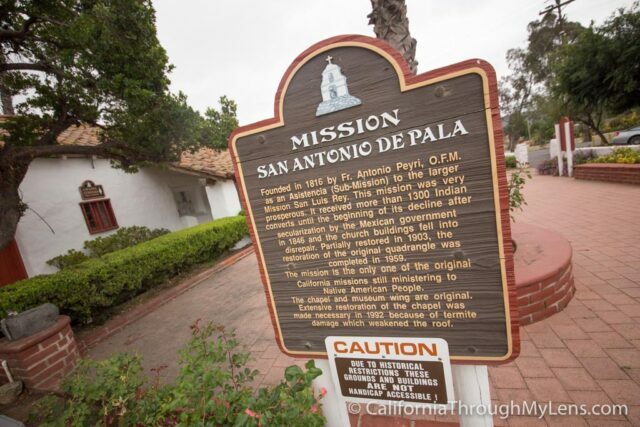 You can read about my time visiting all of the California missions here and about Mission Pala below. 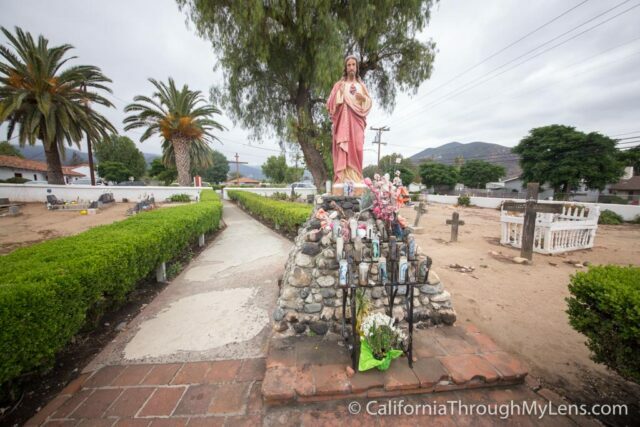 Mission San Antonio de Pala Asistencia is located right on Highway 76 about 5 miles off the 15 Freeway. 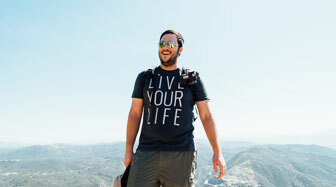 It is on the Pala Indian Reservation, close to the casino and there is a small parking lot you can park in. Pulling up in the parking lot you will immediately see this is a small mission, especially if you came from the other two near San Diego. 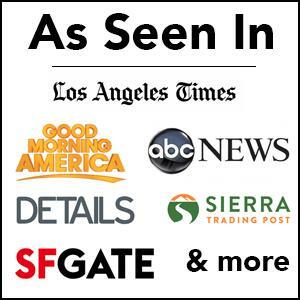 That said it does have a few unique things to see. Since I went when the gift shop was not open I had to just walk around on my own and see the different spots. The first I ventured into was the chapel. 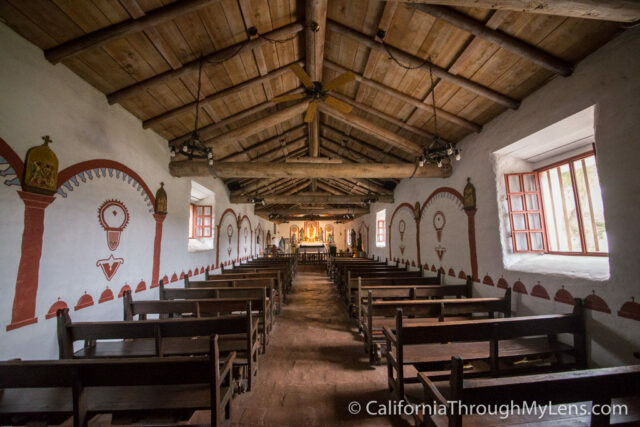 The chapel here is much smaller then the normal mission chapel and it uses a lot of large wood beams, which you do not see as often in the other missions. The chapel can still hold a decent amount of people though and it is working chapel for mass on the weekends. The altar was relatively plain but beautiful in its simplicity, and the walls were covered in a fading pattern. 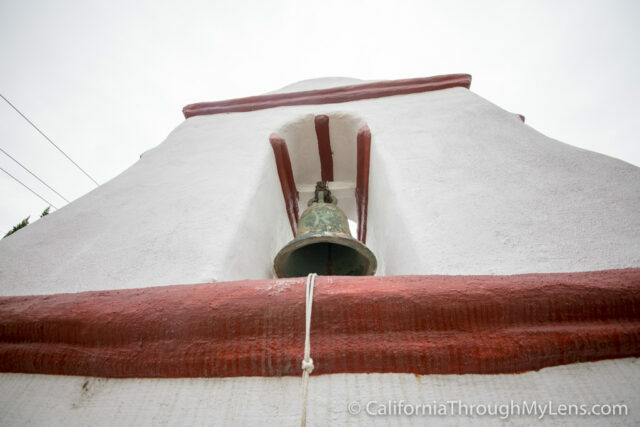 After exiting the chapel we went and saw the bell tower, which is one of the only bell towers not directly connected to the Church in the missions system. 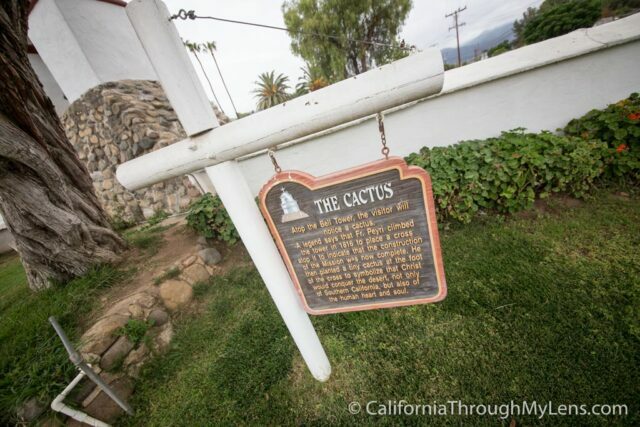 The top of the bell tower has a real cactus planted on it, which is how the padre who created it decided to signify that it was done. The bell tower even had little steps you could walk up to see the historic bells from up close. I really liked it and it reminded me of the big one in San Miguel. 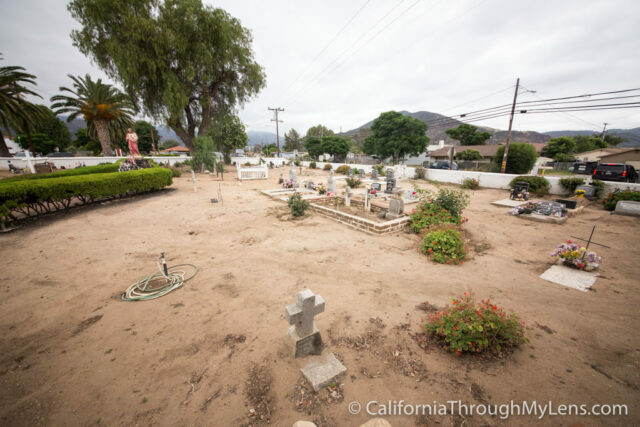 Next to the bell tower is the cemetery for both Indians and people who lived and worked at the mission. 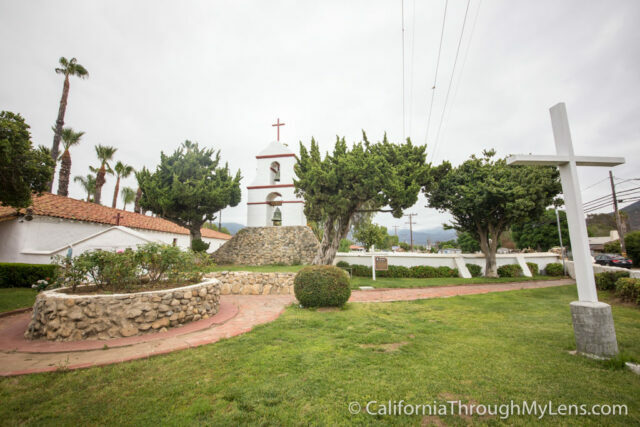 Around the front there is a bell post that signifies this spot as a mission on the El Camino Real Trail. All in all, it took about 20 minutes to walk around this mission and see it. 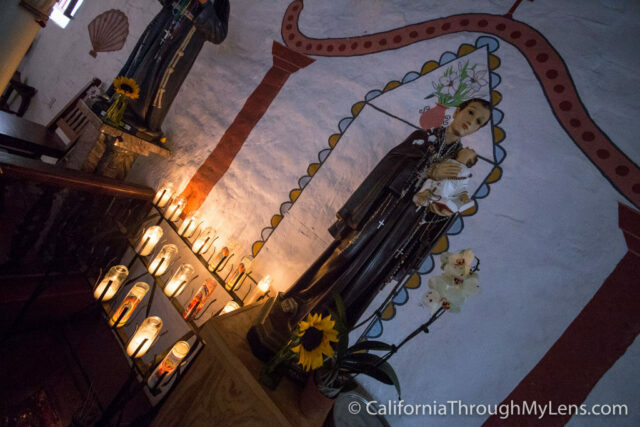 I am glad I came as I have been visiting all the missions, which you can read about here. 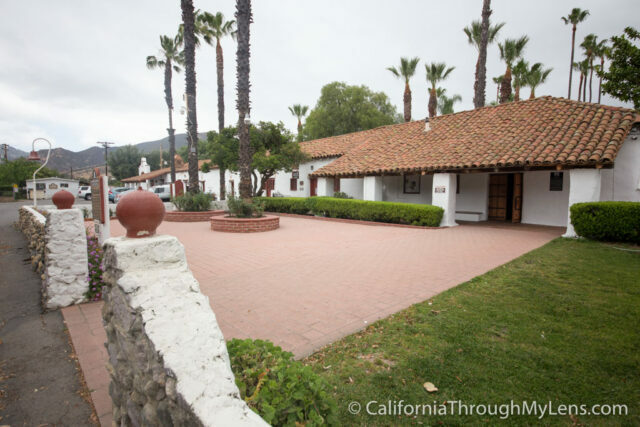 I wouldn’t say you should plan a trip just around visiting, but if you are in the area then it is worth stopping by as it is pretty and historic. Let me know what you think in the comments.